With Smart Tags' Custom Order Rule, you can easily tag orders based on the referring or landing site. This is great if you want to tag orders based on the affiliate link. Shopify captures and populate both fields when a customer places an order. 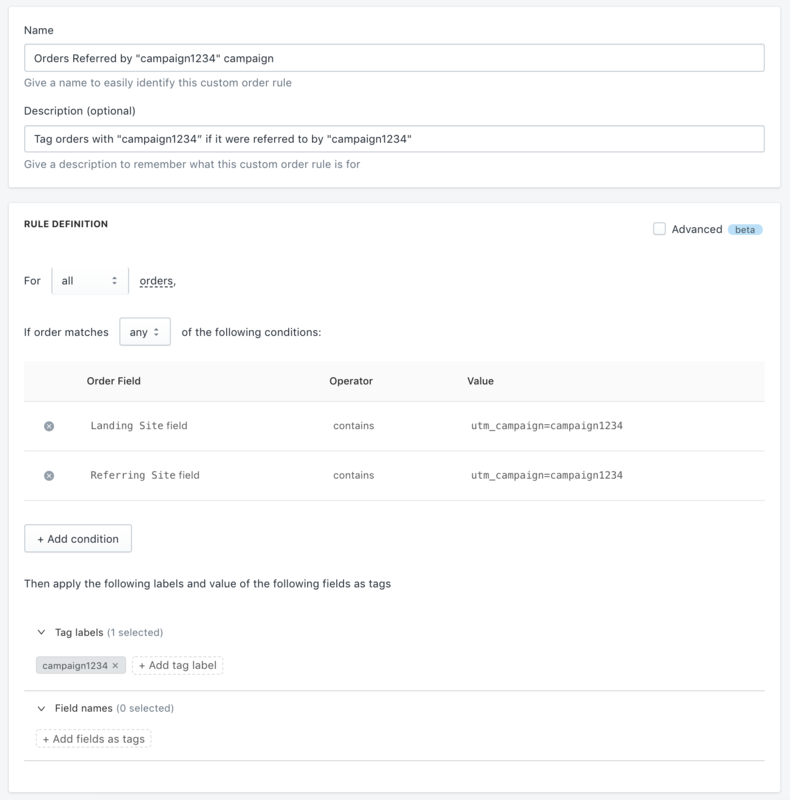 You can use the above fields to tag customers that has orders with Referring or Landing Sites that matches certain text, which might contain the campaign code. Typically, email campaign links will include the “utm_campaign” code in the URL to identify which campaign it came from. Specify a name and description to identify the rule later. This step is optional but helps with managing your Smart Tags rules. Description: Tag orders with "campaign1234” if it were referred to by "campaign1234"
Value: following value > “utm_campaign=campaign1234"
Specify the tag labels that you want to be applied if the product matches the above rule, for e.g: “campaign1234"
Make use of the preview on the right sidebar to ensure that the tag gets applied as expected. If have further questions about getting the above example to work with your business needs, do drop us a message any time.